Wonder Woman had a very good year in 2017, both from a film and collectibles perspective. While the movie had its flaws, the overall impact shouldn't be underestimated. As a life long Batnerd, I'm now far more interested in and excited for any cinematic Wonder Woman announcements than Batman news. I never would have expected it. My new love for the movie Wonder Woman convinced me to pick up the God Killer sword replica from Factory Entertainment. 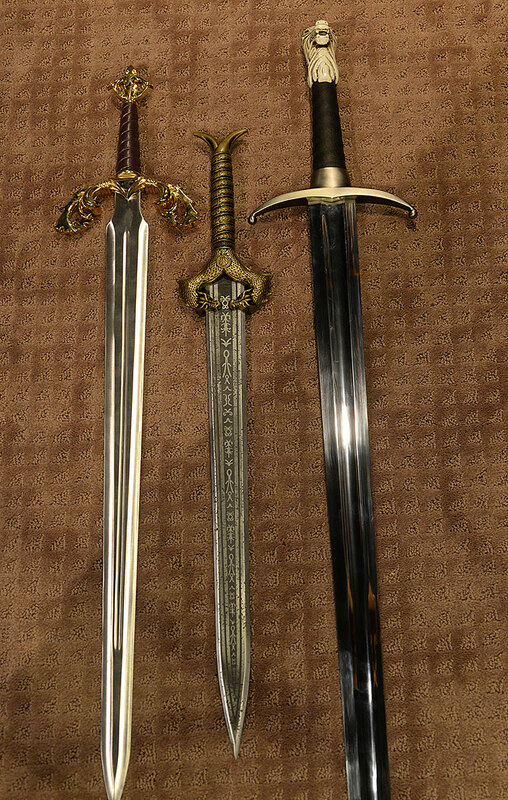 I haven't picked up any sword replicas in awhile - you can only have so many on display. But the iconic nature of this one combined with the exceptional quality I've gotten from Factory Entertainment in the past (they made two of my all time favorites from The Princess Bride) pushed me over the edge. This replica is in stock right now at retailers, and will run you around $250. The photos might appear different than my norm, but it's because I already have this one hanging on the wall of my bar. It just made more sense to take the photos there, rather than schlepp everything out to the barn. I skipped a package shot, because it's pretty basic stuff. Big box, slip cover, standard graphics. 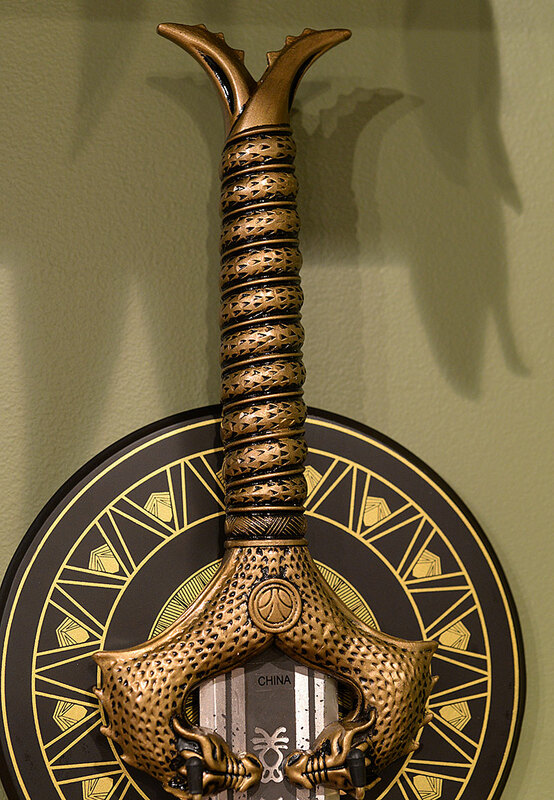 However, it is collector friendly (as you'd expect), and it does keep the sword safe and sound. That's job one, right? 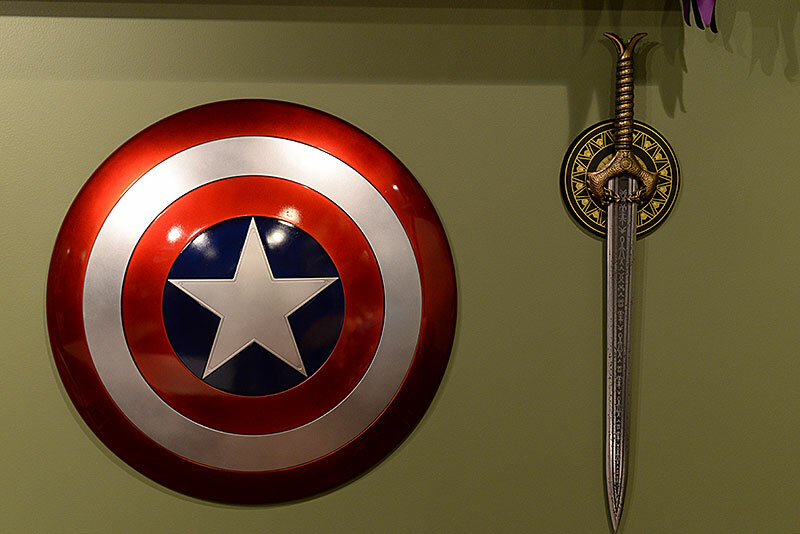 And while I skipped the box photo, I did include one below that shows it hanging on the wall next to the Cap shield for scale and perspective. I was surprised by the size of this sword - most are too long, too heavy, too difficult to wield in an effective way. This is because on screen swords need to be impressive, not necessarily useful. Two handed broadswords look great, but don't make for the best actual combat weapons. This sword is the complete opposite. At 30" long, it's a bit too big to really be a 'short sword', but sword definition is not all that accurate of a science. It is smaller than I expected, and that's why I've included a number of scale photos. Here's a screen grab that shows the sword quite clearly, and of course it was on the main poster. I think the idea that it was larger is mainly in my head - the photos show it's not a long blade. It is wide, and very sturdy, with a nice heft and feel in your hand. The blade is stainless steel, and the hilt is forged metal as well, giving the whole thing the impressive weight you want. Because of the shorter length, it feels all the more deadly, something you can swing quickly and yet pack a punch. It still seems slightly short to me, maybe 2 or 3 inches, but I trust Factory Entertainment when they say it was reproduced right off the actual prop. They've done an amazing job in the past, and I have no reason to doubt them here. Like I said, I think this perception is in my own head. 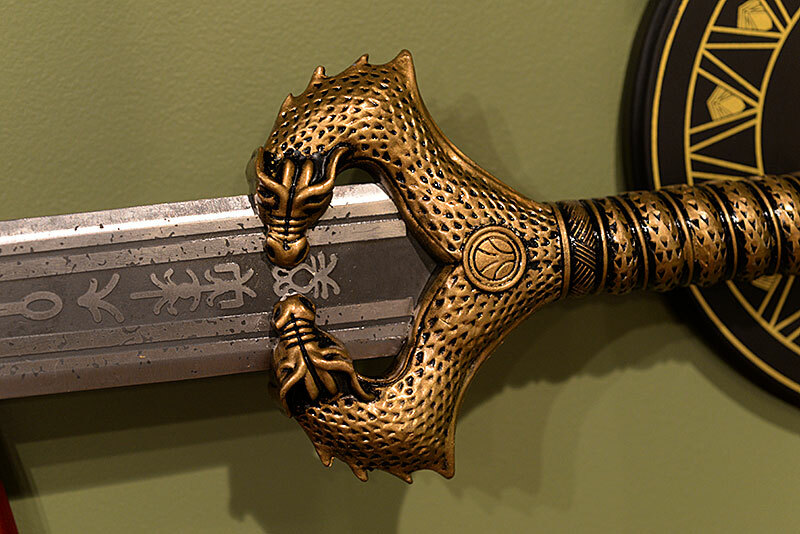 The sculpting on the forged hilt looks great, with the two dragons wrapped around and biting the blade. 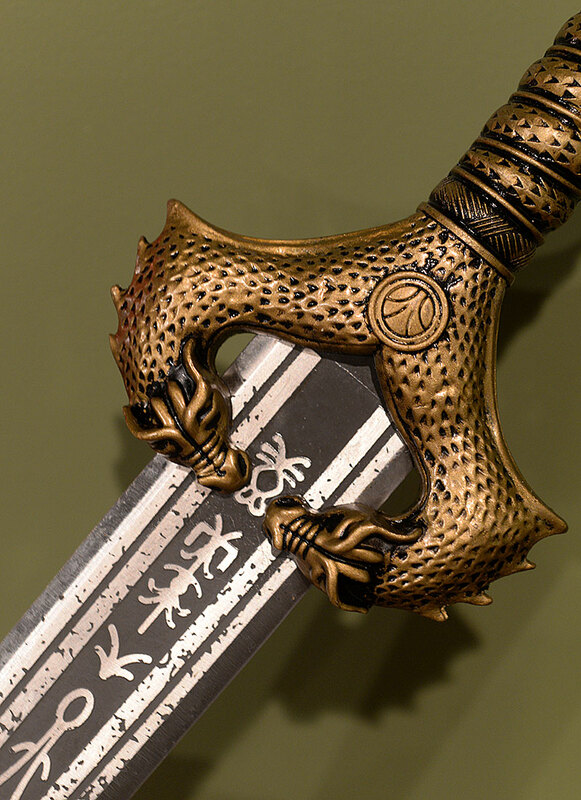 It's a great design overall, and the Amazonian writing and other detailing on the blade is etched as well, not simply painted. 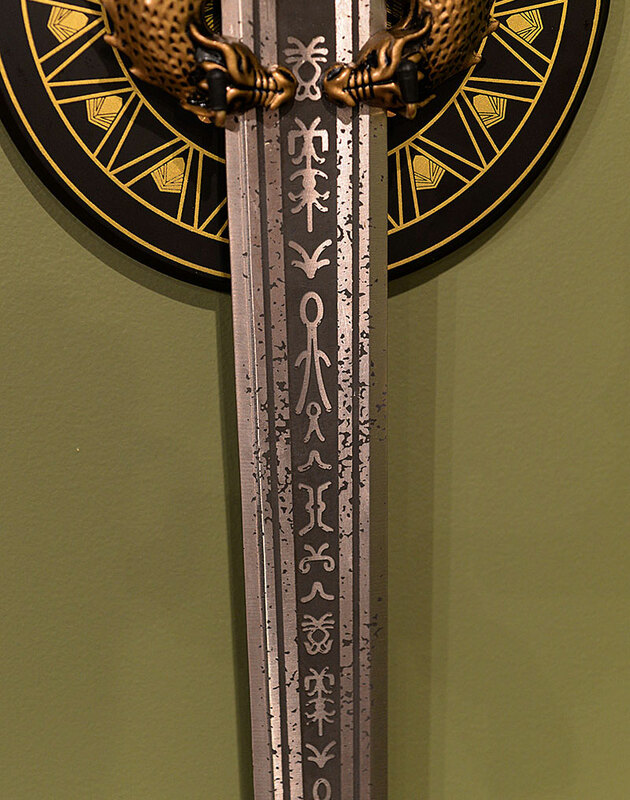 Etched is probably not the best word - they are done like a relief sculpt, with the gray areas cut into the sword. The tip is quite sharp, but the edge itself has not been sharpened. However, it's not purposefully rounded either, so the weapon avoids looking or feeling clunky. The blade includes painted aging, with a burnished appearance and faux pock marks. It looks great, and compliments the dark wash on the hilt. This brings out the detailed sculpt quite nicely, and creates the impression of a very old, very ancient weapon. You'll notice the 'china' label in a couple of the photos. This is only on one side, and it's merely a sticker that you can remove. As soon as I finished the photos, mine was history. Okay, so it's technically not an 'accessory', but the sword does come with a nice wall plaque that is easy to mount and works great. While $250 might seem like a lot (and it is), it's pretty much in line with the market. In fact, I paid that much for other swords several years ago, and I was surprised when Factory Entertainment listed this one at a price that's consistent with swords I picked up quite awhile ago. Regular readers know that a **1/2 here is average, which means the price won't effect my overall either up or down, and you're getting what you're paying for. I really like this sword, even more than I thought I would. I knew the quality would be there based on past experience with the company, but I was still impressed. 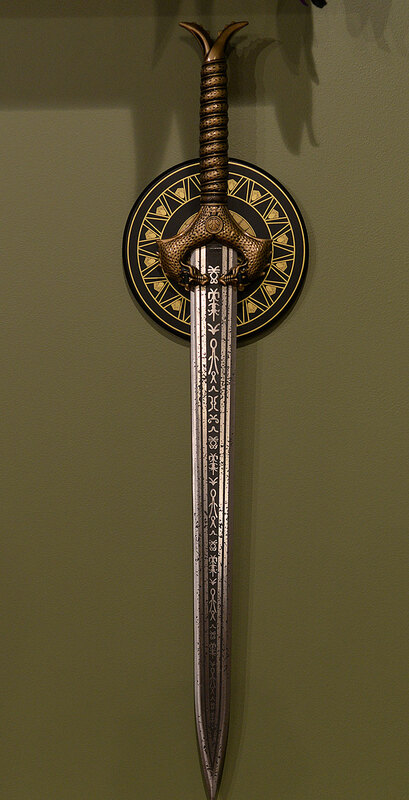 This is going to become a fairly iconic sword for more than one reason, and having it represented in my collection was well worth the price tag. - has it in stock for $250. - Entertainment Earth have a great price at $187 plus free shipping! And those other swords? 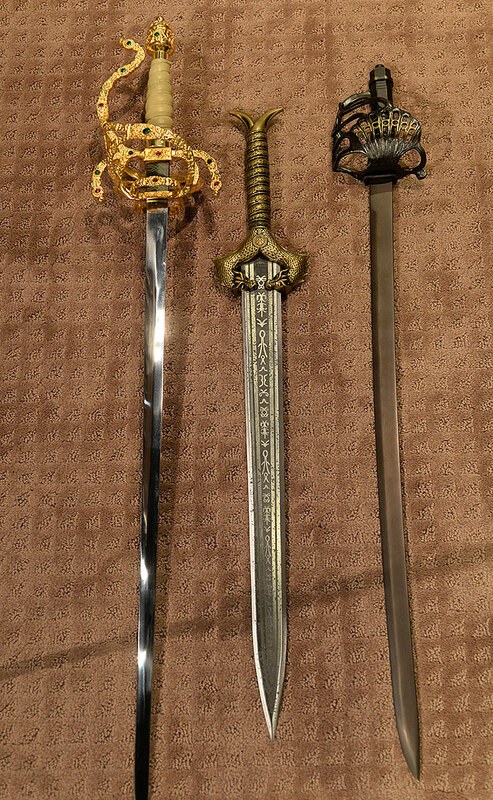 In the first photo of three swords, the one to the left is the sword used by Buffy to send Angel to Hell, and the one on the right is Long Claw of course. In the second photo, I have a personal favorite on the left, Inigo Montoya's sword, and on the right we have Barbossa's blade. If you're a fan of the new Wonder Woman, you need to check out the Hot Toys sixth scale action figure.